Open the door and let 'em in. Last weekend I enjoyed touring some of the inspiring studio spaces in San Francisco’s ARTSPAN Open Studios 2018. This abundant event includes over 800 artist spaces, open to the public for five weekends October 13 - November 11. Every year the program expands and the bar is raised. Even if you don’t open your studio, join ArtSpan for perks like workshops, mixers and exhibition opportunities. This year, I looked around with a particular mission to discover the secrets of a successful Open Studios event. What seems to work the best? I spoke to a few exhibiting artists but mostly used my eyes and instincts to guide me through the day. Below is a list of ideas for artists contemplating participation in their local open studios events. I recommend most artists give open studios a try at least once. It is the best way to prepare yourself for other career opportunities such as curator visits and self-made exhibitions. But don’t attempt this if you’re going to be lackluster and lazy. Make the effort to present your work professionally and doors will continue to open. If you have the opportunity to share a studio space, work in a artists’ collective, or use a host venue, this is a best-case scenario. Group venues get more visitors, provide support among artists, promote together, and help you connect with new collectors. 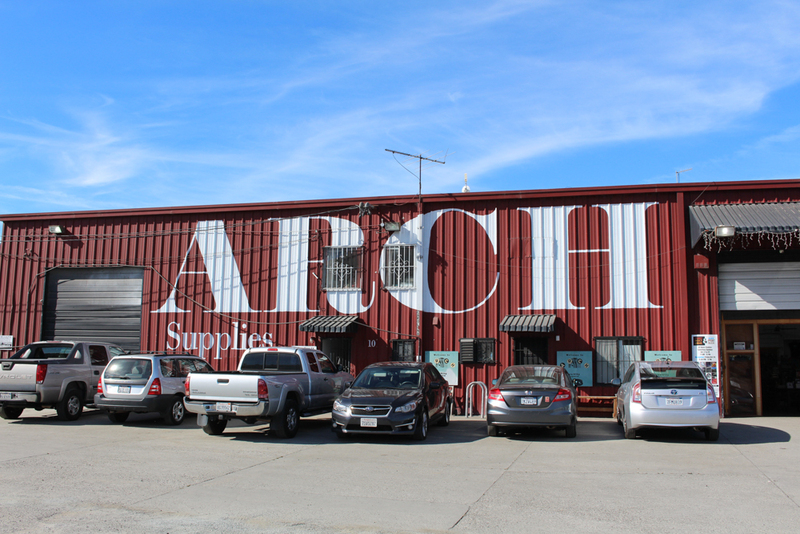 A pop-up display at ARCH Supplies hosted two collectives, Studio Nocturne & Bay Printmakers. The quarters were tight, but visitors could also shop for art supplies while encountering the art and artists. THREE. Advertising is a must. I realize expenses add up when doing Open Studios, but don’t skimp on advertising. When searching through a catalog of 800 potential artists to visit, eyes land on ads. Don’t forget the key info: Name, dates, location, hours plus some perks, like live music or free chocolates. The studios that visitors like to hang out in exude a certain sense of hospitality. Provide seating, add flowers and personal touches. Treat your visitors like guests in your home and they will take the time to connect with your work. Keith Petersen’s bright and welcoming space. The best conversation starter is one about process. People feel more comfortable asking about materials than motivations - so lay out your tools and works-in-progress. Set up a demo or play a video of you working. A glimpse behind-the-scenes will motivate collectors. Below: Rochelle Youk’s colorful Inspiration Board and Pamela Axelson’s tools of the trade. Most importantly, prepare for Open Studios as though preparing an exhibition at a gallery or museum. Display works for sale on a clean, plain backdrop. Label all work with title, date, medium and price. Hang wall work at eye-level with good lighting. Create a price list with images and details and your contact information. Provide handouts such as postcards, brochures, and invitations. Don’t forget the guest book! Yu Jean Choi’s beautiful display of sculpture and jewelry. Finally, don’t forget the follow up. Email visitors with a simple thank you, or offer a discount. Survey them about the experience or ask them which pieces they liked most. Direct them to your website and social media feeds, and continue to engage them throughout the year. Congratulations SFOS18 Artists and the staff and board at ARTSPAN. See you next weekend! Oct 21 Who Are Your Artistic Ancestors?